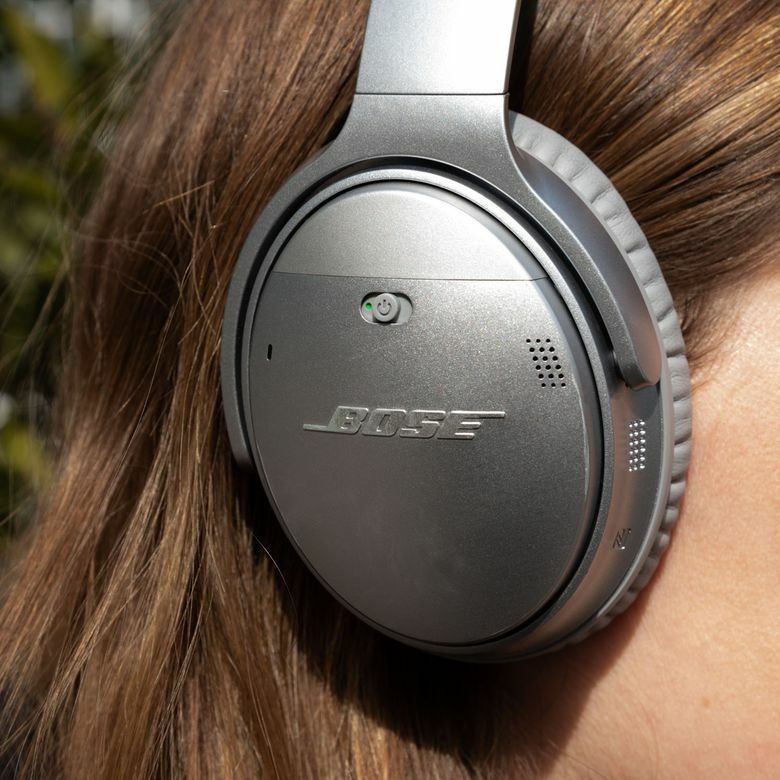 The Bose QuietComfort 35 II is a well-designed pair of noise-canceling Bluetooth headphones with excellent audio quality, a useful app, and the ability to interact with voice assistants, making it perfect for consumers and professionals alike. When you’re considering spending hundreds of dollars on a pair of headphones, you’ll want to find an option that checks all the boxes — noise cancelation, wireless capability, great sound quality, and, of course, comfort. Bose has been at the forefront of the headphones market for years and their QuietComfort 35 II headphones give consumers and professionals multiple reasons to shell out for this high-quality investment. We recently tested a pair to see if they lived up to the hype. We evaluated their comfort after hours of wear time, checked on all the promised features, and considered whether they were really worth that high price tag. Bose paid careful attention to design when creating its QuietComfort 35 II headphones. The pair clocks in at 7.1 inches tall and 6.7 inches wide and weighs just 8.3 ounces, making them easy to take on the go. Bose doubles down on portability by using a swinging, hinge-like design to connect the 3.2-inch-deep earcups to the headband. The move allows you to swivel the earcups at any angle you wish, and makes for stowing your headphones in the included carrying case much easier, since they’ll lay flat and not take up as much room. Realizing that users might often use the QuietComfort 35 II headphones on long plane rides or during work, the company has optimized their comfort. The QuietComfort 35 II uses a suede-like material called Alcantara on the adjustable headband, which is the same fabric you might find used in yachts and high-end cars, according to Bose. These days, you’ll often also find it on laptops and other gadgets, including covers and keyboards available for Microsoft’s Surface lineup. Regardless of whether the noise-canceling feature was turned on or off, the QuietComfort 35 II headphones sounded fantastic. The earcups are made from a synthetic protein leather that feels soft on the skin and keeps you comfortable, even after hours of use. Other than that, Bose asserts that the sturdy pair has “impact-resistant” construction, which makes them less likely to be damaged if you drop them. Overall, these headphones are extremely comfortable. And when we used them over extended periods — weeks and weeks of use — they didn’t cause any discomfort or strain. Bose’s QuietComfort 35 II headphones are jam-packed with technology that’s designed to block out ambient noise and offer the best audio quality possible. We think they definitely delivered on both. The headphones ship with a technology called acoustic noise cancelation. That means that the components behind the earcups are constantly measuring ambient noise around you, which the headphones can then counteract. They pump the opposite signal at your ears to give you a near-perfect cancelation of ambient sounds. We tested the noise cancelation in a variety of environments, including a quiet office, a street with heavy traffic, and a room full of noisy kids. In some cases, Bose’s QuietComfort 35 II headphones were able to completely wipe away any ambient noise, creating a truly immersive audio experience with both music and talk. In certain areas where the ambient noise was simply too loud, these headphones dramatically muffled the noise, making it little more than an afterthought. Acoustic noise cancelation is activated automatically when you power on the headphones using the switch on the right earcup. But, arguably, one of these headphones’ best features is the ability to adjust the noise cancelation between one of three levels based on the noise around you. For example, if you’re at work and still want to be able to hear your coworkers, you can use the lowest setting. But when you head out the door for lunch, you can crank it up to blot out blaring traffic noises. The feature works exactly as prescribed — you can definitely notice the difference between the three settings. And regardless of whether the noise-canceling feature was turned on or off, the QuietComfort 35 II headphones sounded fantastic. Voices sounded clear in our favorite podcasts and the bass and treble in the music we listened to were crisp. To deliver its audio experience, Bose uses its proprietary “TriPort” acoustic headphone structure. It’s a combination of design and high-end components inside the pair that optimize audio playback. And it works extremely well. Bose includes a handy tutorial with its headphones that walk you through the process of setting up Bluetooth pairing between your phone and headphones. The tutorial is exceptionally well done and makes pairing your devices simple. You’ll be ready to listen to music in no time. The Bose QuietComfort 35 II headphones use Bluetooth wireless technology to allow you to listen to tracks and podcasts without dealing with wires. And although Bose doesn’t make a promise on Bluetooth range (wireless signals can too easily be affected by other gadgets you have running in your home), our wireless performance was outstanding. We tried leaving our music source (an iPhone X) in one room of the house to measure how far the audio signal would extend. The signal held out between different rooms and floors. Even when we used the QuietComfort 35 II for calls, the headphones performed well without any major breakdown in quality. It should be noted that while these headphones are designed for wireless use, you can also use them for wired connections, too. The headphones come with a cable that plugs into a headphone jack (if your phone has one) to allow you to keep listening even if your battery runs out. The QuietComfort 35 II comes with a new Action Button that gives you far more control over the products around you. The button, which sits behind the left earcup, is easily accessible and big enough that you won’t waste time looking for it. When you activate it — by pressing and holding the button down — you’ll be able to access either Amazon Alexa or Google Assistant. With help from Alexa or Google Assistant, you can turn on music, find out what’s next on your calendar, or issue a variety of other voice commands through your headphones, provided you have a compatible Alexa or Google Home-powered device. The feature works well and gives you another way to turn on the content you want to hear or access without ever needing to pick up your phone. In order to use it, however, you’ll need to have the Alexa or Google Assistant app configured on your phone. If you’re not an Alexa or Google Assistant user, the Action Button serves as a handy quick-access key for adjusting the three levels of noise cancelation in the headphones. Bose promises 20 hours of battery life in the QuietComfort 35 II headphones, which we found to be spot on. The headphones lasted through an entire workday with no problem and had enough charge to keep going into the evening. Better yet, these headphones have a fast-charging feature that can add another 2.5 hours of life to the battery after just 15 minutes of charging time. Bose’s headphones are compatible with the company’s Connect app, which is available on both iPhones and Android devices. The free app connects to your headphones and gives you a variety of tools at your fingertips. For instance, you can use the app to adjust the volume and decide how much noise cancelation you need while listening to music. You can also personalize your settings — if someone else happens to use your headphones, you can simply boot up the app and quickly get back to your desired preferences. In some cases, Bose’s QuietComfort 35 II headphones were able to completely wipe away any ambient noise, creating a truly immersive audio experience with both music and talk. Bose also provides tips via the app and uses it as a testing ground of sorts, letting you try out new features. Better yet, you can use the app to sync your headphones with another pair of Bose headphones worn by someone else, allowing you to stream content to both devices if you want to enjoy the same music. The Connect app is well designed, simple to use, and its slate of features is impressive. We used it on several occasions to get the settings just right and quickly adjust things with the headphones still on. That said, it can be cumbersome to switch to an app to control your headphones. So, once you have the headphones set up the way you want, the Connect app becomes less necessary. At $349.95 (MSRP) Bose’s QuietComfort 35 II headphones are just as costly as last year’s model. If you’ve used the QuietComfort 35 I in the past (or have heard of them), you’ll find that Bose didn’t change the design at all in the second-generation model. That’s a little disappointing, considering the lofty price tag. That said, the price is on par with competitors in the high-end headphone space, like the similarly-priced Sony WH-1000XM3. There are cheaper options, like the Plantronics BackBeat Pro 2 and Anker Soundcore Space NC, but the further down the price bracket you go, the more you’ll notice a decline in audio and noise-cancelation quality. With the QuietComfort 35 II, you very much get what you pay for. The Bose QuietComfort 35 II may be a fantastic pair of headphones, but it’s not without competitors. The aforementioned Sony WH-1000XM3 matches Bose not only in price but quality. With a dedicated noise-canceling processor, support for higher-resolution audio protocols that transmit more data, and wider frequency range due to the built-in amplifier, the WH-100XM3 has a lot to offer for more audiophile-oriented consumers. Sony has also provided a number of special software tweaks that can take your surroundings into account a bit more intelligently than Bose, customizing the sound for your environment all the way down to atmospheric pressure (for planes). It also has a button for voice assistants, but the earcup controls are mostly swipe gestures and tend to be a bit more finicky than Bose’s physical buttons. Check out our list of the best wireless headphones on the market today, along with our picks for the best Bose headphones and best noise-canceling headphones. Outstanding sound and comfort for the price. The Bose QuietComfort 35 II headphones are among the most popular noise-canceling headphones on the market. And although they’re pricey, they offer an outstanding value for those who want the very best in sound and comfort and like the idea of getting extras such as long battery life, fast charging, and voice assistant support. Product Dimensions 7.1 x 6.7 x 3.2 in.